Tired of those worn, “hole-y,” acrylic or wool hockey socks? Reebok now offers a simple solution: The SX100 Edge Gamewear Hockey Socks. The SX100 Edge Gamewear socks feature wave-knit and mesh-fabric construction, along with a bubble band at the ankle that helps keeps your shin guards in place. 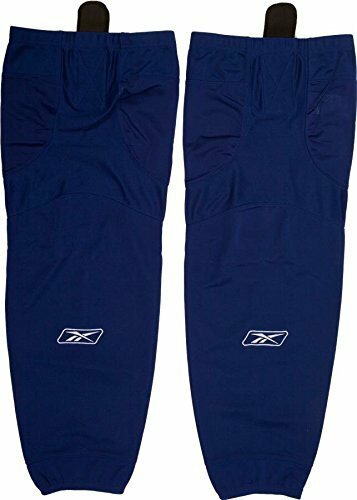 The SX100 socks also sport a sewn-in Velcro tab at the top, ensuring they snugly adhere to your 3-in-1s or hockey shorts. What’s more, the SX100s receive an ultra-fresh antimicrobial treatment, which means they’ll stay daisy-fresh in your hockey bag. The seam and decoration are covered with durable topstitch, and the distinctive Reebok vector logo is embroidered to the front of each sock. I just picked up a pair. These socks do exactly what they’re supposed to: They slip over my shin guards nice and easy, and make me look good enough so that the flaws in my game just might go unnoticed. Next articleDo You Know What’s in Your Beer?